Unlike a normal AC installation, a split AC Installation is not that straightforward. Don’t make the mistake of thinking that both installations are similar. Not only is it not as easy as it looks, but in the case of the split AC installation process, it is even more crucial for you to pay attention to detail. Keep the overall strength of the wall in mind: In this regard, installing a split AC on a paper thin wall is foolish. You’re literally asking for a disaster on your hands. That’s why you need to make absolutely sure of the fact that the walls are strong and thick enough to hold the unit’s entire weight. Both the important aspects of height and space: As far as the height is concerned, make sure that the distance from the floor to the AC Unit is at least 7 feet. Spacing is another important aspect that a lot of people forget about. The ideal scenario would be 15 cms of open space around the sides and top area of the split AC. Remember the importance aspects of the outdoor unit: In this regard, three factors play a vital role, location, placement and distance from the indoor unit. Make sure that the outdoor unit is installed on a rigid surface that is not facing any direct sunlight. Additionally, the distance between the indoor and outdoor unit should not be more than 15 meters. 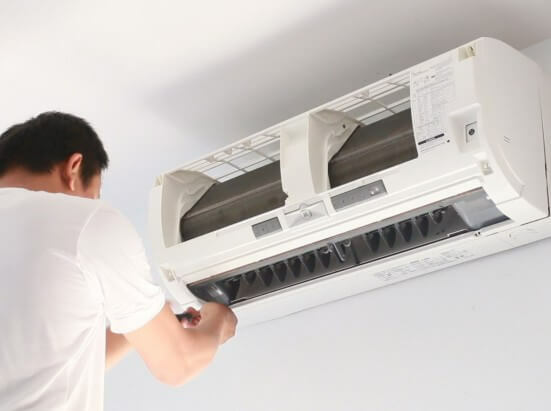 Finally, as far as the air conditioning installation service is concerned, you will need to do your homework thoroughly by doing a thorough check on the work of the company in the past. This is absolutely essential.